When will be this or that announced feature included in public alpha\beta build of Airport Master? As soon as it is practicable; as soon as the feature in question is complete, fully tested and ready for integration with existing parts of the game. 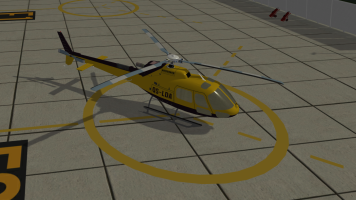 For instance: we had fog and rain effects ready in late 2016, yet those are still not in public alpha build for the following reasons - a) until recently, VMC\IMC and VFR\IFR traffics were not fully implemented; b) fog effects still do strange visual blending with the ground features shader we use; c) helicopters fly VFR\SVFR only - we still need to refine flight planning to take this into account; d) wind and windshears should have more visual impact on rain. This is just an example of how a complex game feature relies on implementation of many game mechanics, logics and thus -take our word for it: each and every major feature will be included in Airport Master Public alpha\beta as soon as it is practicable. What platforms Airport Master will be released on? The game will be released on Windows PC, then about 2-3 months later Linux and Mac versions are planned for release. 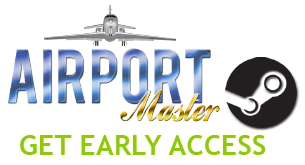 Yes, follow the link Airport Master Early Access on Steam to get Early Access. By participating in Early Access you not just save money as final game will cost more, you also help us build the game and fund our work on Airport Master! Will weather affect flight schedule, timetable, flt ops and airport rating? Once the full dynamic weather is implemented in the game, and as far as player does not have ILS CAT II\CAT III equipment and certification flights will divert to alternate airfield if weather is below minimums (worst minimum is used: airport\aircraft\pilot). In some (rare) cases, when LVP is in effect and during shower rains (SHRA+) some aircraft crews will delay takeoffs until weather improves. That will eventually affect Airport's rating with given Airline motivating player to install and upgrade NAV equipment. How good is game's flight model? What will be the difference between Career and Free-play modes of the game? Career mode is expected to be the main game mode, including building up your Airport from small Regional to large International, participate in various questing activities (City Mayor, Chief of Operations, Airlines quests - we are not disclosing the plot at the moment, but those should be really interesting and shine some light at how background life of an Airport is in reality), challenges, achievements etc. Free-play mode is considered (at the design phase of game development) to be somewhat an extension to late-game content offering smooth transition from main story and quests line to procedurally generated challenges that will ensure seasoned Airport Master players still find it interesting to manage their Airport and play in changing (and to some degree unpredictable) circumstances of Airport's everyday life. Free-play mode will become unlocked after upgrading Airport to final-tier and since then Player will be able to start a new free-play mode game (with new randomly generated standings, relations etc.) or elect to continue the Career mode with his or her current setting. How will the Master Airline Contracts work? Master Airline Contracts will depend on Airport GM's negotiation skill (affected by career background and perks selected when starting a new game) as well as Airport rating with other airlines. It will be possible to get percentage bonus (or penalty) depending on factors mentioned above to service fees being negotiated. That would directly influence the number of flights a Regular Airline can schedule (at max) to Player's airport and will also influence rating change increments\decrements. Once signed, Master Airline Contract will define specific rates and fees for services provided by Player's airport to given Regular Airline. Depending on service quality and Airline Rating it will be possible to amend the Master Airline Contract with new conditions, but only at either extremely good or extremely bad SQ and AR. Financial bonuses and penalties will also be negotiable Master Airline Contract conditions. Will the economics become more unpredictable? Yes, definitely. Our main goal as to economy is to make it so that after couple of weeks of game time two different playthrus would render totally different market situations (both in terms of commodities prices and competing airports services prices). Currently there's some assumed median for fuel cost, hangar time cost, airport fees etc. In future versions those will become more unpredictable and will affect Player's Airport rating if he or she does not keep track of market situation. We have already refined a math model for economical values - it's based on lambda\delta of prices in surrounding Airports (and in case of fuel - at nearby refineries) - this model proved to work exceptionally well as it's been tested on Airlines' ratings. What about other aviation related activities: gliders, para-drops, technical flights etc? Those are planned and most probably will be implemented closer to Beta stage of development. Will there be people (passengers\crews\technicians\cooks\waiters\etc)? There are people in the game already. They are currently represented by user interface avatars. We have considered 3D models of people walking around the airport and of course conducted graphics load tests with various LOD\dynamic details settings of our sub-engine. Based on these tests, we can say that a late game airport (two runways, about 30-50 aircraft, twice as many vehicles, LODed terrain, volumetric clouds etc.) can hold decent 50-60 fps on a modern machine with addition of about 50 to 100 3D-people, so technically it's quite possible. However, we strive to make the Ultimate Airport Management and Aviation game - so 3D-people are not top-priority. For now (up to late alpha\early beta) stages of development we will stick to avatars, but again, it is probable that 3D people may appear in final product. I'm new to the world of aviation. I can see many unknown words and acronyms on these pages - is the game for me? The game does take place in very realistic imitation of real world airport. However, one should not worry: we take it very seriously that a good game should not just entertain but also teach (both youngsters and adults wishing to learn more about exciting world of modern aviation). You will find a lot of explanations to what this or that piece of equipment does in the game, or what stage of flight it is and what are captain's options and choices. You may take easy approach (say just set the fuel price slightly higher than the average sell price per industry) or you may elect to fine tune fuel prices if you have good understanding how FBO's business works. If you know how to read METAR\TAF - good for you - they are there (all as per standards), if you do not even know what those words stand for - no problem - you will find human-readable (decoded) current weather and 24-hour forecast slightly below in the same user interface screen. Incidents (like runway excursions, aborted takeoffs, compressor stalls on jets, emergency landings, engine failures) - yes, those are planned for late alpha\mid-beta. As for accidents (crashes of the airplanes involving trauma and\or fatalities) - no; this is a game about how aviation works not about how airplanes crash or people suffer. We will not be even considering any of such scenarios, please do not ask to include accidents into Airport Master, this will never happen. Please note: this also refers to any symbols of terrorism, hijacking or acts of war. The game ATCs will never see aircraft squawking 7500 on their screens. Will there be pushback operations and pushback tow tugs? Yes. Passenger terminal 2 (East Apron) will utilize pushback at all gates. Initially there will be one type of tow tug, rated for pushing back aircraft with MTOW up to 130 tons. Later on, two additional tow tugs will become available as upgrades: a traditional pushback tug certified up to 250 tons and towbarless tug as an option demonstrating actual controversy of views which tug concept is better. As in real life, towbarless will be best used for relocating aircraft between parking stands and traditional tugs with towbars will be used for pushing aircraft back from gates. Now that achievements appeared in the game, what will be the role of City Mayor? What are Mayor quests? Mayor of Appleton City will be one of key NPCs in the game, offering player various quests and challenges, setting airport business and transportation goals, introducing to some of key Airlines (otherwise inaccessible to Player). Besides, City Mayor subsidies will be crucial to obtain in order to perform costly Airport upgrades such as second runway and large passenger terminal. As in real world an airport is somewhat more an implementation of region's transportation strategy than a business in itself (as opposed to traditional businesses). So, City Mayor will be quite an important NPC in the game. I have been playing Airport Master alphas 0.3.4+ and I noticed you can quite easily level up your character, especially if you pop enough points in Aptitude skill. Will that stay the same and what is the level cap in game? The experience gain curve in the game is a very sophisticated feature. It uses complex formula to ensure leveling up is quite easy say up to level 10 or so and then it becomes way harder. On the other hand, the as the experience curve becomes steeper, the algorithm ensures the bonuses for Higher Tier upgrades and rewards for completing challenges, servicing flights etc. also scale up adequately. The hard-coded level cap is currently set at level 80, however if you sum up all possible upgrades costs and imagine reasonable play time it is safe to say that most Players will hardly hit level 26. This, of course, will not be the case in future versions as new features are added and eventually it will be possible to reach higher experience level than needed at level 80. So technically, it is possible that by early beta level cap will be increased to 100. I have moved flights back and forth extensively in Flight Schedule \ Slot Editor and managed to break it altogether; I filed a bug report and I wonder when the Flight Schedule UI becomes 100% bulletproof to voluntary\involuntary errors on Player's behalf? Flight Schedule and Slot Editor are the most advanced part of Airport Master game. It is being re-developed and improved with every single version build. However, it will take much time and effort (and many invaluable bug reports by Players) to get it to say 98% bulletproof state. With each bug report we get from you on Flight Schedule \ Slot Editor we get amazed at how unexpectedly non-straightforward can people think in terms of scheduling flights (or trying to break the schedule and cause havoc). We do not feel it'd be right to make such an important tool too simple or too restrictive, it must still retain powerful capabilities and that in turn means we do need to develop various solutions for obscure\malicious flight scheduling while keeping the tool as flexible as possible. We see it like so: until very late beta we will still be tweaking and optimizing the fool-proof concepts of Flight Scheduling system. And we cannot stress enough: Players' bug reports play very important role in developing this system and we thank you so much for sending those in along with your saved games! My Flight School student(s) have completed theory and practice hours requirements for PPL. When will they be able to take practical exam to graduate? Flight School is getting a major redevelopment right after we complete integrating Airport Upgrade Tiers and Apron East operations. Aside from flying VFR circuits (already in game), FS students will get to fly IFR, flights to the zone and solo flights. The examination flight and graduation bonuses are also coming. Stay tuned for extended Flight School gameplay! There are mostly latest versions of popular aircraft in Airport Master. Will there be vintage\classic era aircraft like 727s, Edgley Optica etc.? 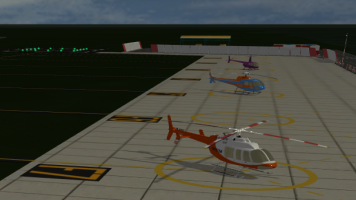 For now, the plan is to include most unique and unusual modern (currently flying or passing certification phase) airplanes in Airport Master. However, we would really love to see retired beasts like MD11s or TU154s (and sure Optica would also look cool!!!) in the game. We suppose that additional aircraft from classic golden years of aviation may become available as inexpensive DLCs grouped into theme-packs: we have data, blueprints and spec charts ready for the following packs as of now: The Cradle of Aviation (think Spirit of St. Louis and later bi-planes), Skysmokers (707, MD11\DC10, L1011 etc. ), Soviet Classics (TU134, TU154, IL86, TU104), Beaute du Ciel (think unique French aircraft designs from 70s-90s); So, these are not final and not yet confirmed but we'd love to include those amazing aircraft in the game close to 1.0 release phase or afterwards. I can already see the diversity of aircraft and liveries in the game. How many unique aircraft and liveries are planned in final product? For main product (aside from DLCs that may become available after v1.0 release, we plan to include around 100 unique aircraft with about 400 unique liveries. Those numbers are not in any way final, but that is what we plan on adding to the main game at the moment. You may have a look at one of on-paper hardcopy issues of well-established Aviation catalogues like Jane's or Flugzeuge aus aller Welt series to have a general idea of what to expect ;-) Keep in mind thou: the general rule of thumb for including an aircraft in the game is as follows - if there exists a newest updated version of the aircraft it goes to the main product - any vintage\classic\outdated versions will rather become available as DLCs.